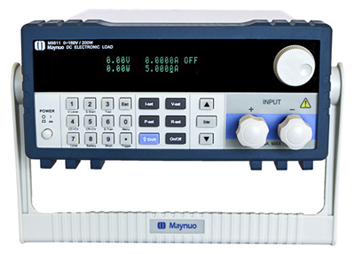 M98 series DC electronic load, as a new generation product of Maynuo Electronic Co., Ltd, is designed for the LED driver application. A special circuit is desiged for the LED driver on the base of the M97XX sereies. Incorporating high-performance chips, the M98XX series delivers high speed and high accuracy with a resolution of 0.1 mV and 0.01 mA (basic accuracy is 0.03% and basic current rise speed is 2.5 A/��s). M98XX series have wide application from production lines for cell phone chargers, cell phone batteries, electronic vehicle batteries, switching power supplies, linear power supplies, and LED drivers, to research institute, automotive electronic, aeronautic and astronautic, maritime, solar celland fuel cell etc.test and measurement applications.